My family of 6 had a thoroughly relaxing stay at Osprey Point. The accomodations are excellent. 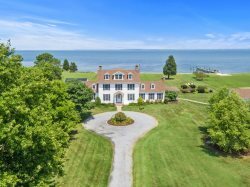 The location is second to none -- quiet and serene, yet in close proximity to St. Michaels and other wonderful towns on the Easter Shore. The only small item ... weeds in the driveway met us. We loved the location, the house, the weather, the water, the pool. It was a wonderful way to reconnect with family and the great outdoors. Next year! Eastern Shore Vacation Rentals is a very professional organization. It was very easy to find a property and get all the paperwork done without a hitch. They fully delivered on all promises.Osprey Point is a perfect vacation property. It is quiet, extremely well appointed and has killer views. The owners have done everything right as hosts. Osprey Point was certainly a perfect place to unwind, relax and enjoy nature. It matches the name of the lane its on, Solitude. An easy place to travel to both St. Michaels and Easton. The home was very nice, comfortable and "perfect". Perfect if 2 families are traveling together. We had one of the best vacations ever. Thank you! This is a special spot - water views, breezes and great place for kids to paddle! Excellent as ever for our 2nd visit.Our only "constructive "comments are:Grass cutting at 7 a.m.twice is a bit early !A brush/mop/squeegee for removing water from the deck after the rains and to clean the kitchen floor would be useful !There are a few weeds appearing on the driveway which spoil the initial impression. comments and thanks for a great holiday,we'll be back again. This is a lovely property. The house is modern and comfortable, the setting is peaceful and quiet. Great place to get away from it all, and it has a deep water dock, which was perfect for the boat we rented. The house is only 5 minutes or so from downtown St Michaels. I would highly recommend this pet friendly property. Wonderful place. Only complaints were the twin beds had no box springs so somewhat uncomfortable. The property is very nice, pool was a plus, was able to catch crabs from private dock, used the canoe on property. Asked for late checkout and maids showed up at 9:00 and left and came back at 10:00 we told them we had a late checkout and then they left again. The house was nicely laid out, water views from most rooms. Nice kitchen, enjoyed crabbing and even caught a red drum off the dock. Would stay there again. Our week at Osprey Point was the perfect escape from the frenetic pace of everyday life. The location is perfect, the house welcoming and comfortable and the peaceful aura lent itself to a wonderful week. We even caught enough crabs to make appetizers for 4!Can't wait to come back! Enjoyed our stay at Osprey Point. Beautiful location, very peaceful and quiet. We really enjoyed the layout of the house - master bedroom suite on one end - two bedrooms/bath other end. Great for families. Lovely shops in St. Michael's. Would return again. THis was a wonderful place to stay, however, unfortunately the place was a bit dirty. Almost all of the dishes, and kitchen pots and pans were really dirty!! This was so disappointing. However, we loved the location so much we are returning in hope that the cleanliness will be improved. Stayed with two teens in mid-june. Weather was hot so the pool was great. Got out in the canoe every day, crabbed, lay around and read. Short drive to Easton or St. Michaels so shopping or dining was very easy. Caught fish and crabs from the dock. We will be back. Loved the one level home with vast waterfront views. Wildlife was abundant and the pool is a perfect cool off on a warm day. Bring your mosquito repellant as we received several bites. I would love to stay here again. A ramp for the Kayak to slide in and out of the water's edge would be great! The house was furnished and decorated very well. It was quite clean and comfortable.! Osprey Point is in a great location. Very peaceful on the water, and just a 5 minute drive from St. Michaels. The outdoor area is perfect for kids - nice pool (a little small, but big enough), great deck, and shady yard areas. The crabbing off the dock was wonderful. The view from both inside and out are great.The home is in good condition. However, the kitchen could be updated. Appliances are fairly old and haven't been updated along with the rest of the house. The house is very well laid out and appointed. The openness of the back to the creek provided beautiful, peaceful views and a lovely breeze. Loved the house and pool! Unfortunatly we were in the season when horseflies were prevalent and they were annoying.